Check the Trial License Limitations topic for more details on the available licenses. Log into your Telerik account. The next page allows you to download the Automatic Installation msi file, DLLs and themes, PDB files, NuGet Packages, documentation files, and Source code. [license] could be Trial or Dev depending on the license you have. [version] is replaced with the version the file corresponds to. Telerik_UI_for_WPF_[version]_[license].msi – automatic installation, check Installing Telerik UI for WPF from MSI file for more details. Telerik_UI_for_WPF_[version]_[license]_Hotfix.zip – used for manual installation, for more details check Installing Telerik UI for WPF from ZIP file. Check Setting a theme topic for more information on the Xaml and NoXaml binaries. Check Installing UI from a Nuget package for more details on using the provided packages. This section contains the offline documentation as well as the ApiReference (both as CHM and Help3) of Telerik UI for WPF and DocumentProcessing products. You could download the complete source code of the WPF Demos application as well as the provided sample applications. 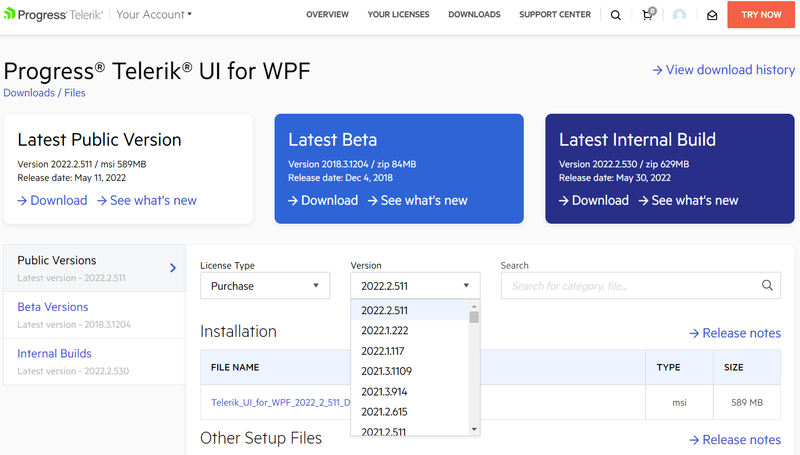 Telerik_UI_for_WPF_Source_[version].zip – complete source code of the Telerik UI for WPF product, available only with Developer license. Please note that if you do not see the desired version you can contact our sales team and they will enable the version for download.